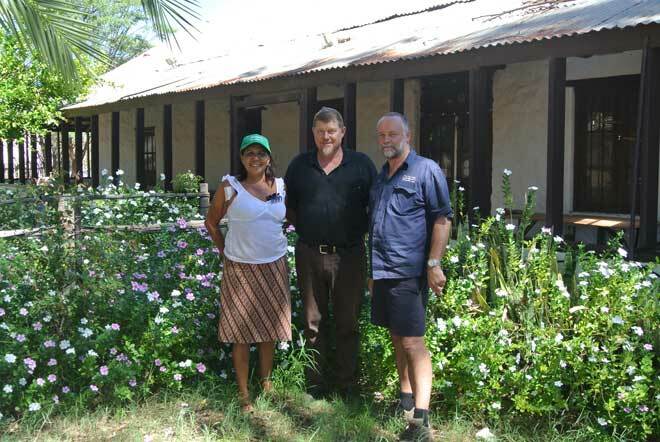 Member for Namatjira Alison Anderson outside the tearooms with the Finke River Mission’s Pastor David Kuss and Selwyn Kloeden. Following the signing of an MOU at Hermannsburg (Ntaria) this morning, the community’s historic precinct and tearooms are open again under the management of Finke River Mission (FRM). The precinct, a popular destination for tourists, has been closed since late last year. In taking over, FRM’s interest is in “serving the community” with an emphasis on local employment and training, says Stephen Hoffmann, the mission’s Finance Secretary. The precinct, more commonly known as “the Old Mission”, remains the property of the community and profits will be returned to them. It is protected under the NT Heritage Conservation Act and listed on the National Heritage register. Mr Hoffmann understands the Hermannsburg Historical Society will be re-activated to “oversight its historical integrity”. Originally established in 1877 by Lutheran missionaries from Germany, most of the surviving buildings were constructed during the time of Pastor Carl Strehlow. The mission is strongly associated with him, his wife Frieda and his son, T.G.H (Ted) Strehlow, with Pastor F.W. Albrecht and his son Paul, and with the famed Arrernte watercolour painter Albert Namatjira. The land was handed back by the mission to its traditional owners in 1982. A big clean-up has been underway to “get facilities into shape”. “We’re close to being there,” says Mr Hoffmann. But some visitors aren’t waiting. Selwyn Kloeden, manager of the FRM store in the community, had the local bakery turn on hot meals for a tour group today. Apple strudel and sandwiches are also on the menu at the tearooms, with scones soon to follow. The entrance fee of $10 remains the same. Visitors can tour the buildings and visit the gallery that houses two original watercolours by Albert Namatjira and also offers for sale contemporary watercolours in the Hermannsburg style. It’s hoped that in the future it will also be a retail outlet for work by the Hermannsburg Potters and that local artists will paint there, says Mr Kloeden. Another “high priority” will be to train local tour guides, says Mr Hoffman. The precinct will be open 363 days a year, closed Good Friday and Christmas Day. Hours are 9am-4pm, Monday to Saturday (or by arrangement with management, 89567402). Sunday opening, at 10.30am, will follow church service. Hi, I have just recently been told my grandmother worked as a nurse at the Hermannsburg Mission. I am not sure of the dates, her name was Leonnie Frawley (married name Cupit). Just wondering if you are able to confirm this? Hi Vicky. So sorry you’ve had this problem! I’ve emailed it to you. But I’m glad you liked the interview! If anyone else has trouble with downloading the ebook please shout out. I’ll get it to you one way or the other. The Hermannsburg Heritage Precinct is undoubtedly one of central Australia’s most under-appreciated historic places. Its significance is underscored by the fact that it is one of only four Territory places registered on the Australian National Heritage List, alongside Kakadu and Uluru-Kata Tjuta National Parks and the Wave Hill Walk-off Route. They share a place on the list that includes the Sydney Harbour Bridge and Opera House, the Melbourne Cricket Ground (MCG) and Mawsons Huts in the Australian Antarctic Territory. 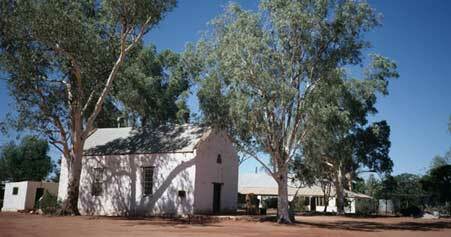 Despite all this, many locals have never been to Hermannsburg and some, I’m sure, do not even know of its existence. I hope its “resurrection” will be supported by increased visitor numbers and NT Government assistance in better promoting this NT heritage gem.